Hello everyone… Welcome to Joy Clair December Blog Hop! Every month they have a blog hop to share inspirations with you all. So, let’s get hopping with us! You should arrive from my fellow team mate, Lori. She shares a fun project there too. 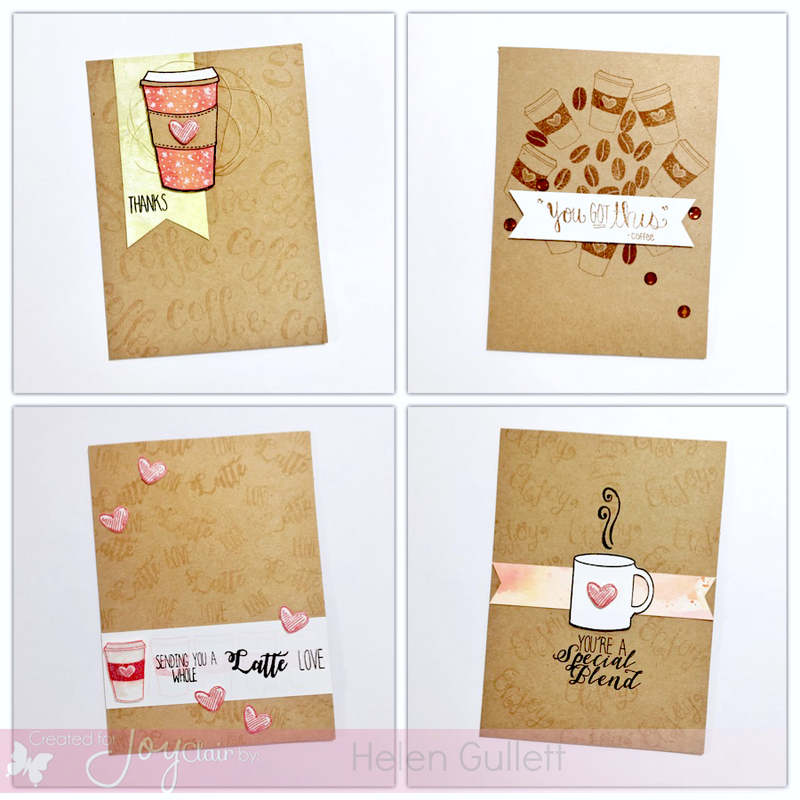 So, today, I am sharing not only 1 but 4 cards with the new Coffee Lovers stamp set. I go with kraft and CAS style on all for of them. I created the backgrounds with stamping, did some watercoloring on the cup and mug images, and I created some marble banners with Tombow Dual Brush pens and plactic acetate. 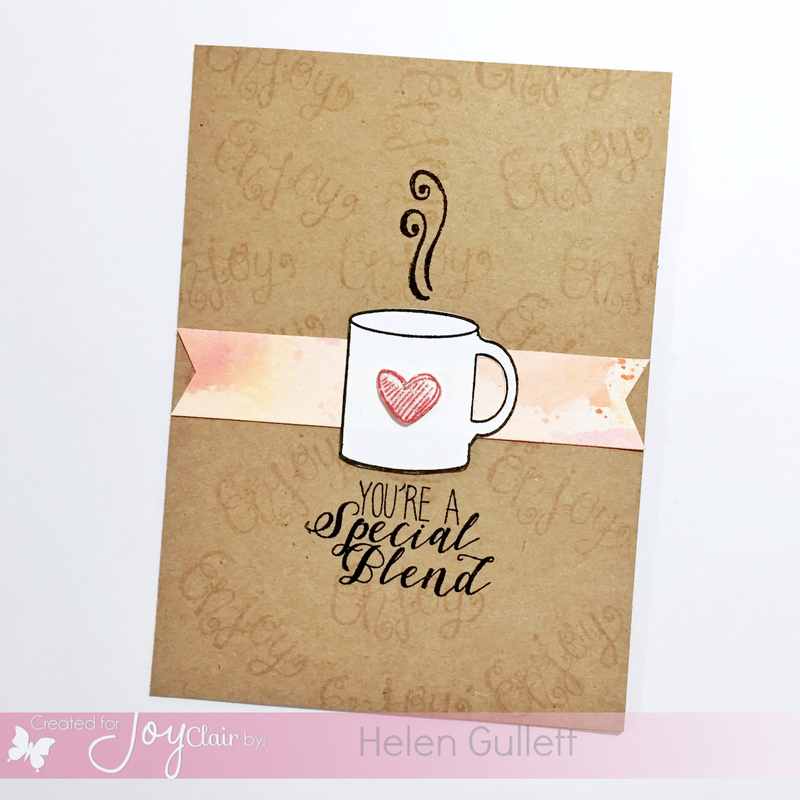 On the first card, I added some gold thread behind the cup, and cut out a stamped heart for the cup sleeve. I stamped the sentiment on the watercolored banner. I colored the cup with Spectrum Noir Colorista set 4 pencil colors. On the second card, the embellishments are cut out hearts. I stamped on white card stock, fussy cut them and added some glitter with Spectrum Noir glitter brush. I also added some glitter on the coffee cup. And on the fourth card, I drew a circle then stamped the cups and coffee beans inside it with Vintage Photo distress ink pad to create the background. Then cut out a banner with white cardstock, stamped the sentiment, and added on the card with 3D foam tape and then finished it with some brown gems. As always, when you hopping with us and leaving a comment along the way on each blog, you have chances to win 1 (one) of the 2 (two) $25 gift cards to spend at Joy Clair store. And… if you want to have a double possibility to win just join our Facebook Group and leave a comment there too to identify yourself and give yourself the second ticket! You have until Sunday, December 4th at midnight (ET) to enter. The winners will be announced on the Joy Clair Blog. Helen Gullett — that’s me! THANK YOU for visiting me today. Have a fabulous blessed day! Your cards are all so cool! I saw these on FB too and admired them there. Thank You so much for visiting me, Verna! Four beautiful coffee cards! I love the backgrounds you created and the pretty colors on your cards! I love your set of Coffee Lovers cards! Such a fun set… glad I ordered it! These are fabulous! Just love coffee-themed cards, and this set looks like a must-have! I so need this stamp set! These fabulous cards could make a great Christmas gift set to our coffee loving friends! Love that you used it on kraft paper, too. Helen, this card set is AWESOME. Yay for coffee :)! This is a fun set… you made great samples using those stamps, love the repeated sentiments in the background and cute little hearts!